The Cash Discount Program is a way for merchants to eliminate processing fees without increasing prices. Thanks to the DODD-FRANK ACT that prohibits payment card networks from inhibiting the ability of anyone to provide a discount for paying cash. Unlike other programs, the cash discount program is legal in all 50 states. As stated in the Durbin Amendment, businesses are allowed to offer a discount to customers as an incentive to pay by alternative methods, including cash or check. There has always been a stipulation in the Visa and Mastercard regulations that allow for a discount when paying with cash. How it works: A 3.9% customer service charge is applied to all store sales. If a customer pays with cash, the fee is eliminated. Example: If you sell a product for $10.00, our proprietary software adds .39c for a total of $10.39. You get to keep your full $10.00, and the .39c goes to pay the credit card company. If your customer pays cash, the .39c customer service fee is eliminated. Either way, you don’t get stuck paying credit card fees. What do I need to start offering the cash discount program? We make implementing the Free Fee Cash Discount Program simple. 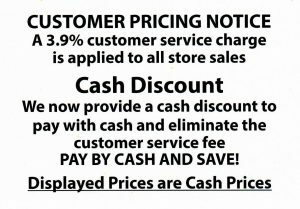 You post signage stating that all store sales carry a 3.9% service charge. However, if you pay with cash, the customer service charge is waived. Displayed prices are cash prices. PAY BY CASH AND SAVE! When you swipe or insert a credit card,our proprietary technology does all the work for you. What if my customers get upset with the fee and go elsewhere? Don’t sell your customers short. Many consumers are starting to realize just how expensive it has become for your business to to accept credit cards. If explained that the small service fee is to cover the rising cost of credit card acceptance that merchants pay when credit cards are used, your customers will understand. And for the small business that only takes cash because of the exorbitant cost associated with credit card processing, you now have an entirely new revenue source. You concentrate on growing your business, we’ll pay your credit card bill. We are so confident in our Cash Discount Program that if at any time you are not 100% satisfied, we will switch you back to traditional credit card processing for free, no questions asked. No, the Cash Discount program, while seemingly similar, is actually very different, particularly in the eyes of Visa and MasterCard. As mentioned in the preceding Q&A, the 2013 ruling against the card networks resulted in merchants now being able to implement a surcharge. The surcharge is allowed in all but 10 states (California, Colorado, Connecticut, Florida, Kansas, Maine, Massachusetts, New York, Oklahoma and Texas, plus the U.S. territory of Puerto Rico). In a Cash Discount program, all prices in your store carry a 3.9% Service Charge. The posted prices are your cash price. Those who pay with cash do not have to pay this fee. This is not a situation where those who pay with a credit card pay more.